E. Salas, Series Foreword. Part 1. Overview. T.D. Allen, L.T. Eby, The Study of Interpersonal Relationships: An Introduction. W.K. Campbell, S.M. Campbell, Theoretical Approaches to Workplace Relationships: Suggestions from Research on Interpersonal Relationships. Part 2. Perspectives on the Positive and Negative Aspects of Relationships. J.E. Bono, D.J. Yoon, Positive Supervisory Relationships. B.J. Tepper, M. Almeda, Negative Exchanges with Supervisors. C.D. McCauley, Reflection and Integration: Supervisor-Employee Relationships. J.R.B. Halbesleben, Positive Coworker Exchanges. R.W. Griffin, A.C. Stoverink, R.G. Gardner, Negative Coworker Exchanges. P.E. Spector, Negative and Positive Coworker Exchanges: An Integration. J.A. LePine, J.R. Methot, E.R. Crawford, B.R. Buckman, A Model of Positive Relationships in Teams: The Role of Instrumental, Friendship, and Multiplex Social Network Ties. M.K. Duffy, K. Lee, Negative Interpersonal Exchanges in Teams. G. Chen, P.N. Sharma, Bringing Together the Yin and Yang of Social Exchanges in Teams. H. Liao, D. Woods Searcy, Positive Exchange Relationships with Customers. A.A. Grandey, P. Grabarek, S. Teague, Negative Relational Exchanges of Customers and Employees: Performace and Well-being Implications. B. Schneider, K. Lundby, Service Relationships: Nuances and Contingencies. J.H. Greenhaus, R. Singh, Positive Nonwork Relational Exchanges. T.C. Rothrauff-Laschober, T.D. Allen, L.T. Eby, Negative Nonwork Relational Exchanges and Links to Employees' Work Attitudes, Work Behaviors, and Well-being. J. Holliday Wayne, Integrating Positive and Negative Nonwork Relational Exchanges: Similarities, Differences, and Future Directions. Part 3. Methodological Approaches to the Study of Relationships. D.J. Brass, D.S. Halgin, Social Networks: The Structure of Relationships. C.E. Lance, R.J. Vandenberg, Dynamic Change and Levels of Analysis Issues in the Study of Relationships at Work. Part 4. New Frontiers for Research on Relationships. L.T. Eby, T.D. 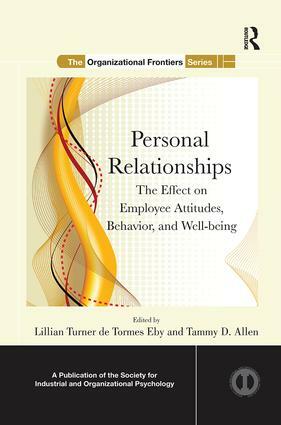 Allen, New Frontiers: An Integrative Perspective on How Relationships Affect Employee Attitudes, Behavior, and Well-being. Lillian Turner de Tormes Eby (Ph.D., University of Tennessee), Professor of Psychology at the University of Georgia (UGA), has published over 80 scholarly journal articles and book chapters on a variety of industrial and organizational psychology topics. Her research has been published in scholarly outlets such as the Journal of Applied Psychology, Personnel Psychology, Journal of Vocational Behavior, Organizational Behavior and Human Decision Processes, and Journal of Management. She has also co-edited two books with her long-time friend and collaborator, Tammy Allen, The Blackwell handbook of mentoring: A multiple perspectives approach and the present volume. Her current research interest centers on the positive and negative aspects of mentoring relationships, stress and burnout at work, and the intersection of work and family life. She serves on the editorial board of several scholarly journals and is past Associate Editor of Personnel Psychology. Currently she is the Principal Investigator on three multi-year, multi-million dollar research grants from the National Institute on Drug Abuse (a division of the National Institutes of Health) to study workforce development issues and organizational innovation in substance abuse treatment organizations. She is a Fellow of the Society for Industrial and Organizational Psychology, the American Psychological Association, and the Institute for Behavioral Research at UGA. Tammy D. Allen is Professor of Psychology at the University of South Florida. She is a Fellow of the Society for Industrial and Organizational Psychology and the American Psychological Association. Her research centers on individual and organizational factors that relate to employee career development and employee well-being at both work and home. Specific interests include work-family issues, mentoring relationships, career development, organizational citizenship, and occupational health. She is the author of over 100 scholarly book chapters and peer reviewed articles that have been published in a variety of journals, including Journal of Applied Psychology, Personnel Psychology, Journal of Vocational Behavior, Journal of Management, and Journal of Organizational Behavior. Her research has received best paper awards from organizations such as the Academy of Management and the Society for Training and Development. She is a recipient of the Academy of Management Mentoring Legacy Award, which recognizes scholars whose work has been germinal to the research and study of mentoring. Her previous books include, The Blackwell Handbook of Mentoring: A Multiple Perspectives Approach (co-edited with Lillian Eby) and Designing Workplace Mentoring Programs: An Evidence-Based Approach (co-authored with Lisa Finkelstein and Mark Poteet). She is Associate Editor for the Journal of Applied Psychology, past Associate Editor of the Journal of Occupational Health Psychology, and has served on the editorial boards of Journal of Management, Personnel Psychology, Journal of Vocational Behavior, Human Performance, and Journal of Organizational Behavior.